Louisiana Castle, a replica of an English Norman Keep Castle, is a romantic venue for wedding ceremonies, receptions or any special event. Whether you are planning an elopement, a small intimate event or a large wedding Louisiana Castle is the place where "your dreams come true." You really can have your wedding in a castle in the United States! Breathtaking outdoor ceremonies, elegant receptions in our ballroom, and a throne room for memorable photographs are just some of the factors that make Louisiana Castle the unique and ultimate venue for the bride looking for that very special place. The bridal suite, known as the Juliet Suite, which occupies the entire top floor of the Castle is available for the Bride and her bridal party to prepare for the ceremony. Want the ultimate wedding night? How about having an entire Castle for that special night! When the reception is over, everyone leaves and the entire Castle is yours. 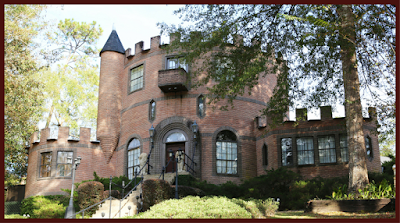 Louisiana Castle has hosted many destination weddings. Destination brides find the Castle very convenient because of our location is near New Orleans and our complete packages. Our packages include a fully decorated ceremony site and ballroom. The ballroom decor includes white linens, chair covers, silver bows and floral centerpieces for all tables. The packages also include catering, a wedding and grooms cake that you design with the baker and our DJ for the ceremony and reception. Please browse the rest our web site that includes a video tour, prices and services, a photographic tour and commentary, photo galleries and the history and love story of the Castle.